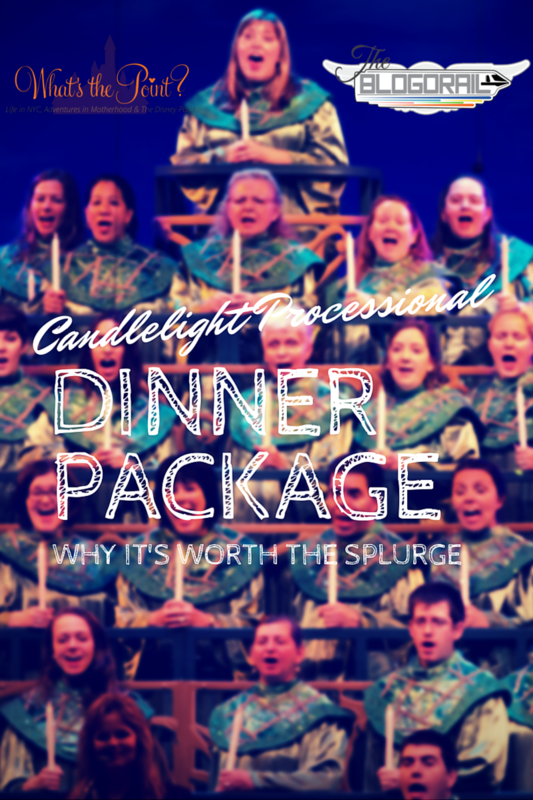 Candlelight Processional Dinner Package - Worth the Splurge | What's the Point? Welcome to this month's Blogorail Orange Loop. Today we are sharing ways to splurge on your next Disney trip that won't break the bank. There's nothing quite like Christmas at Walt Disney World Resort. 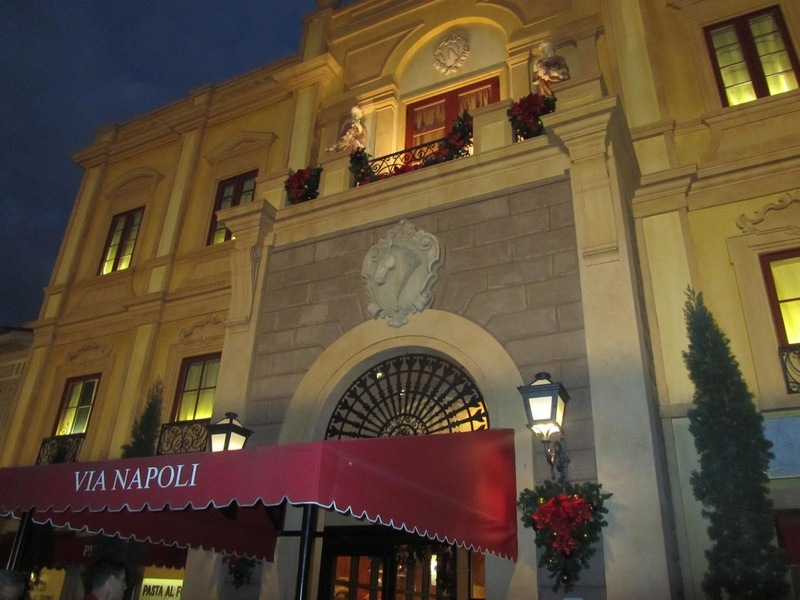 In every park, at every hotel and across the entire property, you feel an amazing Christmas spirit that truly radiates. While the bright lights of the Osborne Family Festival of Dancing Lights are loud and proud, and Mickey's Very Merry Christmas Party is fast and furious, my favorite Christmas activity at Walt Disney World is Epcot's quiet and powerful Candlelight Processional. What is the Candlelight Processional? It's a retelling of the Christmas story (the one that doesn't include Santa Claus) by a celebrity narrator, accompanied by music - a 50 plus piece orchestra and large choir made up of visiting groups and Cast Members. 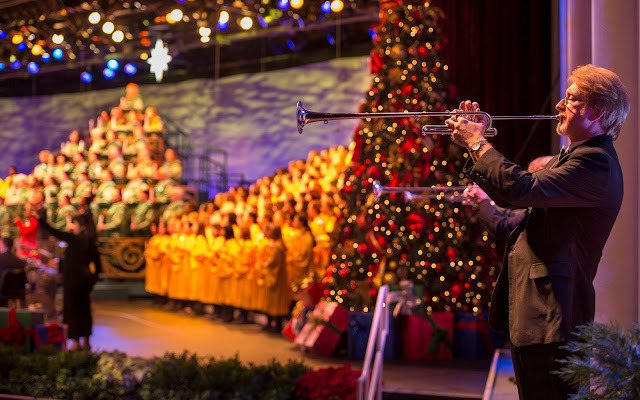 Three times a night in late November and December, candlelight and joyful song illuminates the American Gardens Theatre in Epcot. Of course, I'm not alone in my love for the Candlelight Processional. A small, intimate theater combined with popular celebrity speakers and large crowds can be daunting. There is a way around the hour lines, though, and it may not be as big of a splurge as you think. If you're a) planning on eating dinner and b) planning on going to the Candlelight Processional, I highly recommend booking a Candlelight Processional Dinner Package. Fourteen Epcot restaurants are participating in this special deal. You can make your reservations for lunch or dinner, and if you're worried about the price lunch is much more reasonable. Lunch ranges from $37.99 to $60.99 and dinner ranges from $51.99 to $75.99 for adults. For full pricing, click here. To make reservations, call Disney Dining at 407-WDW-DINE or visit Walt Disney World Holidays. 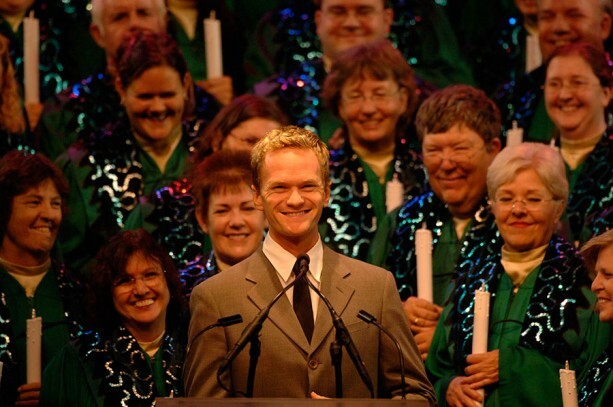 I was beyond thrilled when I saw one of my favorite celebrities, Neil Patrick Harris, will be narrating the Candlelight Processional during my post-Thanksgiving trip. However, with Neil narrating, I knew that the lines would be even more out of control than normal. Because we usually sit down for dinner in Epcot anyway, the dinner package was no brainer. Some restaurants are more pricey than others. We made reservations to eat at Via Napoli, one of the better deals, at $53.99 per person. For what you get, I believe this is a very reasonable and worthy splurge. For more reasonable splurges at the Disney Parks, check out the other great posts from the Blogorail!